Generally requires 24 hours notice and next day delivery. With all the favorites like fresh fruits, chocolates and cheeses, it’s a classic example of just how great a basket can be. Suggest a large full size card for your message. 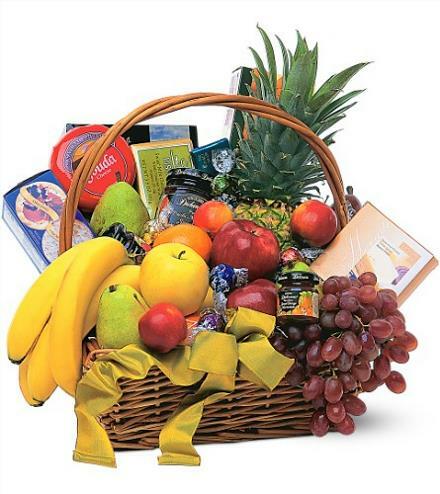 Gourmet Fruit Basket is fine selection for Anniversary Basket will be trimmed to suit the occasion on your card message. Florist Notes: Classic Fruit & Gourmet. This will be created by hand by the local florist using fruit and gourmet gifts available and popular in their market area. Arrangement Details: Other great add ons include some themed helium balloons and a teddy bear. Hand delivered by a nearby local florist.